with special guest Andy Cairns, founding member of Therapy? All proceeds to Velindre Cancer Research. 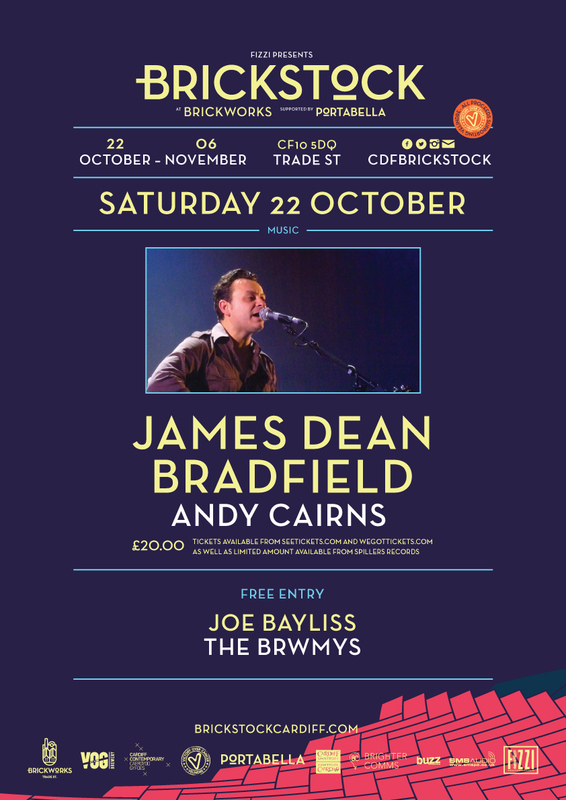 Manic Street Preachers lead singer James Dean Bradfield is headlining a unique music and cultural festival in Cardiff this autumn. The rock star is the main attraction at the Brickstock at Brickworks event, which takes place over three subsequent weekends in October and November. The event, presented by Fizzi Productions and supported by property developer Portabella, will take place between 22 October and 6 November at Brickworks on Trade Street. As well as a full line-up of musical acts, including Cassetteboy vs DJ Rubbish and Captain Accident and The Disasters, the festival will include several exciting art projects from the likes of Andy Fung and Pria-Borg-Marks. There will also be a range of craft workshops, cinema screenings and a wide variety of food and drink stalls including Trade Street Café and Tukka Tuk (Anand George), and breweries including Vale of Glamorgan Brewery and Crafty Devil. Portabella MD David Loosemore said: “We are proud to support this unique cultural event in such an exciting up and coming part of Cardiff. “Trade Street is one of the city’s hidden gems; it has a thriving creative scene and an incredible feeling of history and community. While most of the events and attractions will be free, there will be a charge for some workshops and tickets will be required for some musical acts.